St. Marys, PA, October 30, 2018: The Elk County Society for Special Services (ECSSS) Fund, under the management of the Elk County Community Foundation (ECCF), recently awarded a $1,000 grant to St. Boniface for seventeen additional activity centers for their pre-school program. The ECSSS Fund, established in 2003, awards grants to non-profit organizations that provide services for deserving and qualified charitable purposes with a preference to Pre-K education programs. Since the early 90’s, St. Boniface has offered a half-time preschool program. Their goal is to provide a Christian-based full-time preschool for area students in the near future. Innovative learning materials at new and improved work centers will provide both educational and social opportunities for the students. 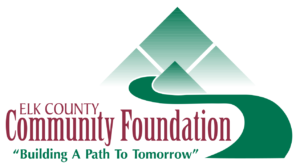 For more information on the grants and services offered through the Elk County Community Foundation, visit their website at www.elkcountyfoundation.org or contact ECCF at 834-2125. ECCF is a non-profit organization that strives to strengthen our region through development, stewardship and grant making as it works with donors to achieve their philanthropic goals. Pat Straub, representing Elk County Society for Special Services, and Amy Leuschel, Pre-School Teacher, along with St. Boniface pre-school students display the new educational materials obtained through a grant from the ECSSS Fund.